Earth Day Desserts Recipes Are Stepping Up Their Game – Are You Up To Speed? Earth Day is a great time to get out in nature and celebrate the planet we call home. It’s also an excuse to make Earth Day-themed desserts! And OMG were we surprised by all the amazing Earth Day desserts out there. Earth Day is stepping up it’s game. If the quality and quantity of Earth Day dessert recipes is any indication, this holiday is going to start to be a big one in the 21st Century. Mark my words! :) Also, if you’re celebrating Earth Day by hosting a bake sale or would just like to make something special, take a gander at these amazing dessert recipes. Hold the world in your hand before you take a bite out of it with this cookie recipe! Aside from food coloring and the way you put it together, this is just a basic sugar cookie dough. Go with a recipe you love or follow in the footsteps of the baker who created these. Give your kids a chance to help out and see if they know what continent goes where. It’s a teaching tool and a delicious recipe all at the same time! 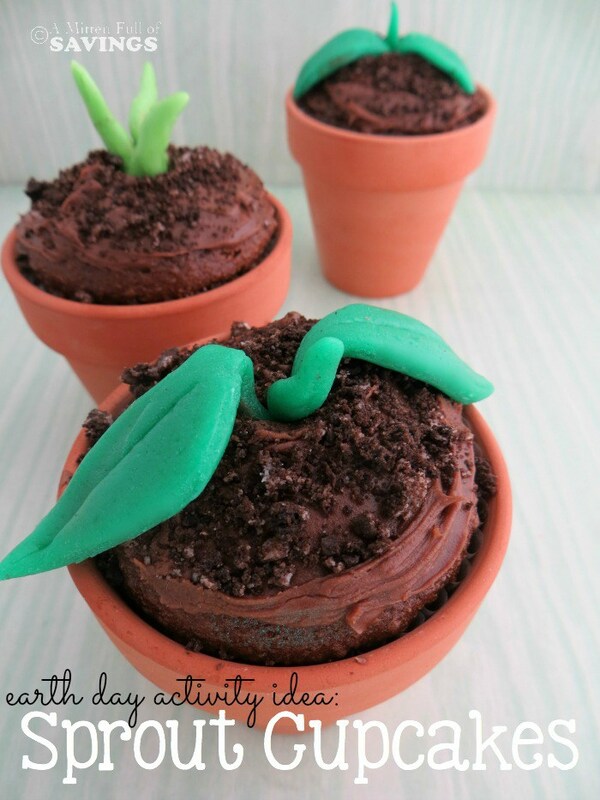 Tiny terracotta pots disguise these cupcakes as sprouting seedlings! They’re super cute and individual sized, so if you’re having a bake sale, bringing sweets into school, or having an Earth Day event, these would be a great dessert idea. They travel well, plus, they’re super thematic and everyone can use the pot afterward to plant a real veggie or flower if they’d like. Whip up some chocolate cupcakes and chocolate frosting and then either use fondant for the stems or green candies that look like sprouting seeds. This might be my favorite of all the Earth Day dessert recipes. This is a recipe and a craft all in one! You can transform regular blue paper cups (preferably recyclable) by glueing green paper in the shape of continents to the outside. 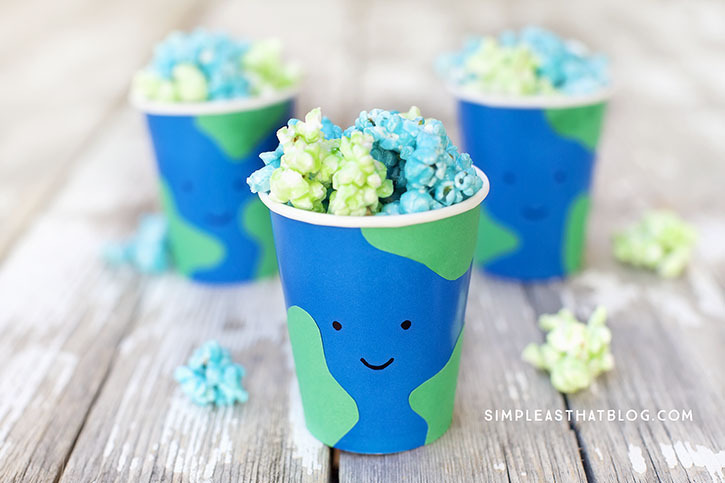 With a marker, you can add this cute little smile to turn your Earth Day popcorn cup into something sweet and cheerful. When it comes time to make the popcorn, make sure you seperate it into two batches so you can dye the coating green and blue. You can simplify it all too by sticking with one color. 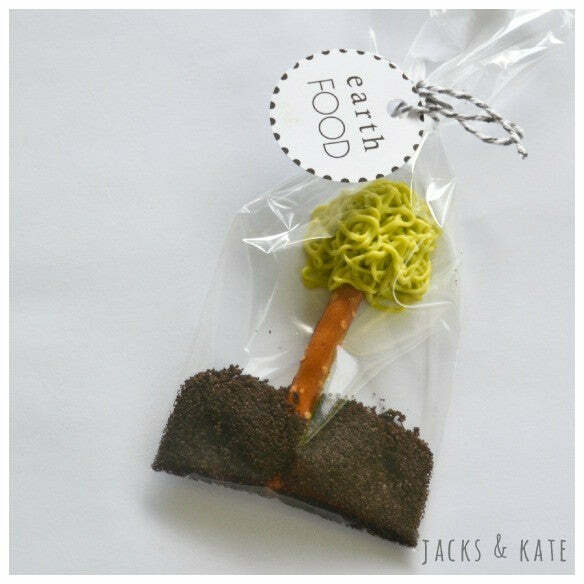 Whether you go sweet or savory, this is one Earth Day treat you won’t want to miss. While a stump means that a tree was cut down, it can remind us to work hard to preserve the earth! If you’re planning on hosting an event for Earth Day, give this tree stump cake a try. You’ll need to dabble with fondant to achieve the look, but it’s very moldable and easy to use. Take a practice run a couple weeks before to make sure you have the skill down. If you’re not comfortable with fondant, you can frost the top of a cake white and the sides with chocolate icing. Just make sure to texturize it so it keeps with the tree stump look! The days of believing that the earth is flat are long gone. 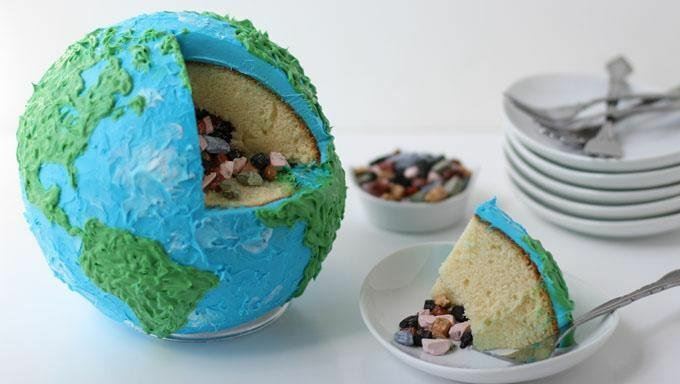 Celebrate the spherical nature of the earth and all of its layers with this 3D earth cake. It’s a great lesson in science since you can fill the inside with rock-like choco rocks candy to represent the earth’s mantel, crust, and core. Plus, it’s a serious show-stopper when you cut it open in front of guests and candy pours out. Earth Day should be a huge celebration since it’s where we live. Make a statement this April by making this earth cake for all of your friends and family! 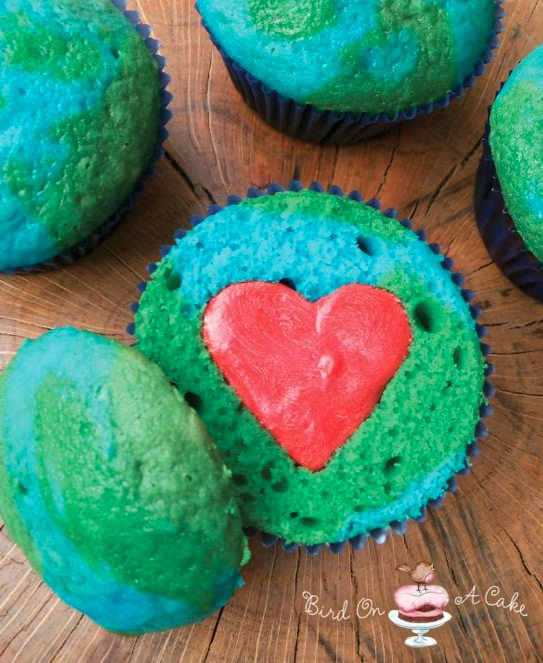 Share your love for planet Earth with these blue and green cupcakes. This person filled in a hole with a heart, but you could make it easier by topping your cupcakes with heart-shaped candies or frosting. Use blue or green wrappers to complement the colors of the cupcake or black if you want to make it look like outer space. If you’ve ever made a marble cake, this recipe is pretty similar. You’ll just have to swirl green through the blue cupcake base to achieve this look. 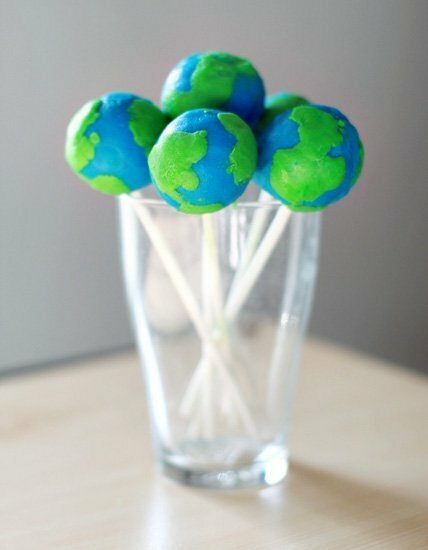 Cake pops are perfect for Earth Day treats because they already have the globe shape you need. Use the recipe below or any of your favorite and make sure to use blue and green fondant on the outside to make these pops look like our world. Serve them like so in a glass or wrap them up individually for guests. Just make sure to use eco-friendly wrapping if you do so! We featured an Earth-shaped cookie above, but these are a lighter and more whimsical option. 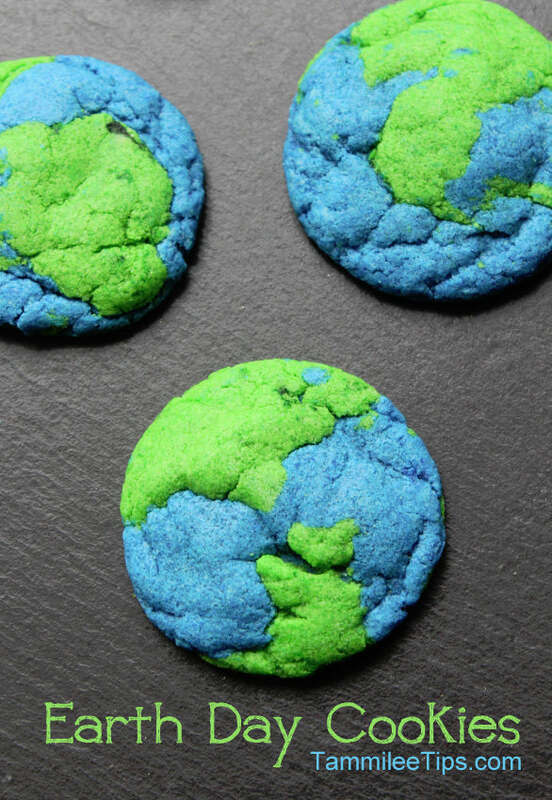 Instead of dying the cookie dough blue and green, these cookies utilize colorful frosting to achieve the look of our home planet. If you like to paint, then just consider this to be a chance to complete your culinary masterpiece. 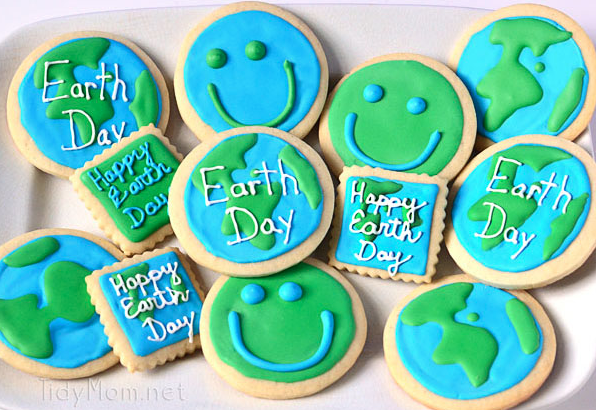 These Earth Day cookies look great set out on a platter for everyone to nibble on at will or wrapped up in bags for a bake sale. These tree pops show off nature and dessert at its finest. The one thing we will say is don’t put these in plastic bags! That’s not very earth friendly. Instead, you could place the base of the pretzel into a mini Reese’s Cup or melt chocolate and then sprinkle cookie crumbs on top so it all stays in place. Do one better by making a bunch of these pretzel trees and putting them on top of a chocolate cake. Just use your imagination and let your taste buds guide you in the right direction. Here’s another spin on the planet we all orbit on. 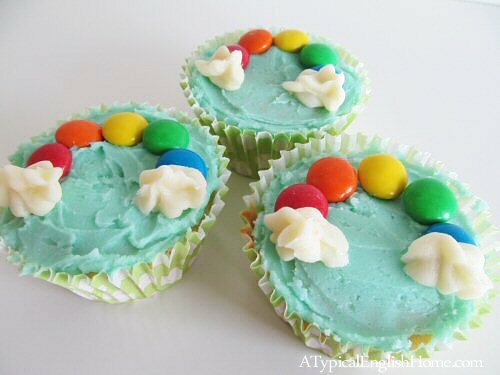 Make blue and green frosting separately and then put it on a piping bag together. 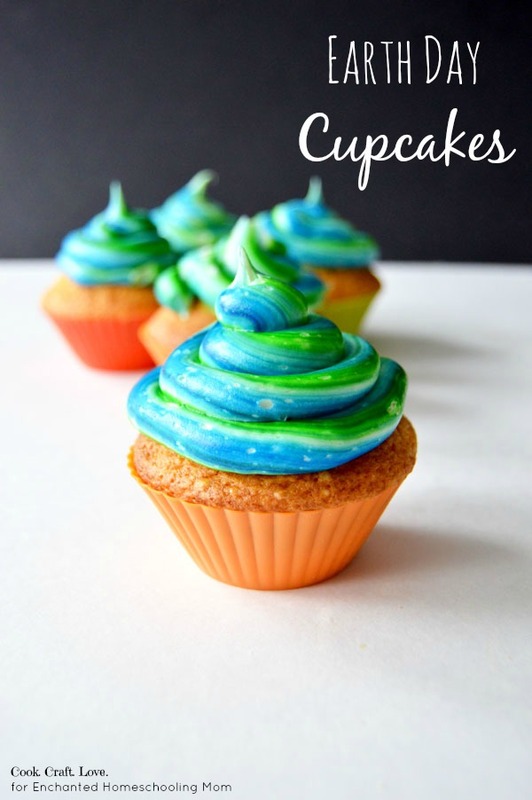 With a plain circular tip, you can swirl the icing around the cupcake to create this blue/green tye dye effect. It’s a more modern spin on Earth Day dessert recipes that won’t cost you too much time in the kitchen. You could buy prettier cupcake liners too with clouds on them or little trees to enhance the theme of Earth Day. Get two for one in this video. You’ll learn how to make two Earth Day friendly desserts: cupcakes and cookies! Using food coloring strategically, you’ll be able to make a blue and green treat that resembles the earth. If your kids love to bake, put them to work mixing up the different colored cupcake and cookie mixes and pouring them into the pans. You can handle the hot oven stuff, but we’re sure the whole family will help out once eating time comes around. This recipe shows you how you can make a variety of designs for Earth Day with one batch of cookies. With smiley faces, continents, and type that says, “Earth Day,” you can make a pretty sampling of cookies that will be perfect for this nature-loving holiday. Since this is such a customizable recipe, you can make a bunch of cookies and then let your kids and their friends design one how they see fit. Educate them about earth day and then see how they translate that into dessert form. It’ll be a fun and interactive activity everyone can enjoy. The water cycle is another huge part of what makes the world go ’round. Teach your kids about how water evaporates from the ground, turns into vapor in clouds, and then returns back into liquid form as rain. You can talk about rainbows and why rain acts like a prism for the sun to cause these colors to appear in the sky. Once the lesson is over, you’ll have a sweet rainbow M&M’s reward for everyone to munch on. We showed you a hollow spherical cake above, but this one is just as impressive. With actual cake representing the different layers of the earth, it’s an edible science lesson and Earth Day treat. It does take a bit of doing to create this 3D wonder, but it’s well worth it when you cut into the cake and watch everyone’s jaws drop. Watch the video to learn how to make the cake yourself. Trust us, it’s a sweet sculpture you’ll want to try. Wow I like the last 3D cake! It’s awesome!